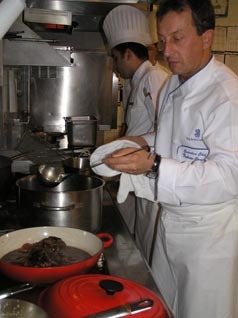 Executive Chef Fabrice Canelle of Çintemani Restaurant at the luxurious The Ritz-Carlton Istanbul takes time out of his day to share his culinary and artistic vision as well as recipes. After honing his career in Paris, Dallas, Chicago, Washington, DC, San Francisco, New York at the highly acclaimed Russian Tea Room, and the prestigious Çiragan Palace in Istanbul, Chef Fabrice joined The Ritz-Carlton Istanbul in January 2006, and has been non-stop in his innovations for Çintemani Restaurant. One of his innovations has been designing and implementing a Gentleman's Menu and a Lady's Menu for the restaurant, since he believes men and women eat differently. When not dreaming up new recipes or new concepts, or spending time with his wife and his two children, he spends this time creating culinary themed artwork, using the tools of his trade, namely forks, spoons and knives, which he fashions into art pieces. While I was there in March 2006, he was working on two pieces featuring a tomato and an eggplant, for an exhibition in May 2006 at a fashionable gallery in Istanbul. When not pursuing artistic endeavors, he enjoys helping to promote young Turkish chefs, to really give them a chance to succeed. Important Note: This recipe must be made 6 days in advance. Horseradish Whipped Potatoes Method: Use old large potatoes. Peel them after they have cooked in a steamer. Mash them with cold butter, sea salt and hot boiled cream. Whip them by hand and add some freshly grated horseradish. Serve immediately. Method: Boil the milk. Mix the semolina and butter in a pan. Add the boiling milk, Parmesan cheese and season to taste. Pour the mixture in a tray and let it cool down. Cut all of the ingredients including the pomegranate, and mix for the vierge. Panfry the fish. 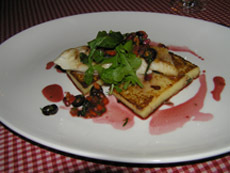 Serve with grilled semolina disk and vierge. Please read our articles on The Ritz-Carlton Istanbul in the Destinations, Hotels and Resorts, Restaurants, Spas and Liquor Cabinet sections. Please read our articles on Turkey in the Destinations, Hotels and Resorts, Spas, Restaurants, Chefs' Recipes and Luxury Products sections. For additional information on Turkey, please contact: Turkish Culture and Tourism Office, www.tourismturkey.org. For Turkish Airlines information, please contact them at Turkish Airlines, www.turkishairlines.com. © July 2006. Luxury Experience. www.LuxuryExperience.com. All rights reserved.